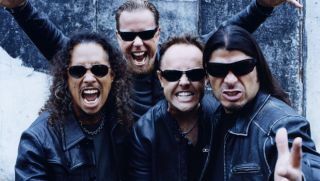 Drummer Lars Ulrich on New Metallica Album: "We're Going to Be Recording Very Soon"
With a 3D film and a music festival in the works, it's hard to believe Metallica will be able to find time to write and record a new album. That said, that's exactly what they're doing. Aside from being one of the most successful bands of all time, Metallica are perhaps the most covered band of all time, with the exception of maybe the Beatles. After releasing it digitally back in December, Metallica will release their Beyond Magnetic EP as a CD on January 31. Metallica have just posted a 45-minute (!) video recap of the final show of their 30th anniversary celebration, which can be seen below. Just over a week after wrapping up their 30th anniversary celebration at the Fillmore in San Francisco, Metallica have posted a 27-minute recap video of the first of the four concerts. Metallica Streaming Another Unreleased Song, "Just A Bullet Away"
Metallica Streaming Previously Unreleased Song, "Hate Train"
Last night as part of their 30th anniversary, Metallica debuted an unreleased track from the Death Magnetic sessions live at the Fillmore in San Francisco. Metallica have just posted live footage from their recent concert in Abu Dhabi, their first show in the United Arab Emirates. You can watch footage of the band performing "Ride the Lightning" below.